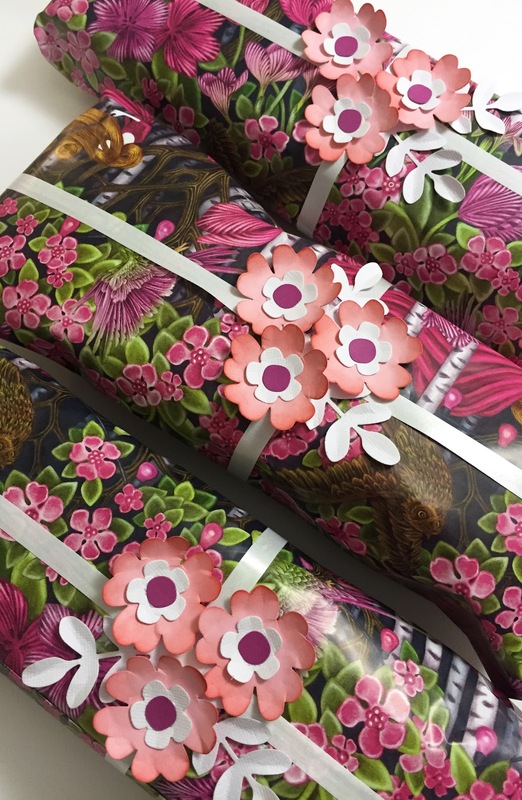 I have to admit that even if I'm a passionate paper crafter and always give only self-made cards, I'm pretty bad when it comes to gift wrapping. I spend a lot of time in selecting the gift, as matching the gift with the receiver is pretty important to me. But after the gift is either bought or self made I don't pay too much attention on the gift wrapping. Which is actually pretty sad because a beautifully wrapped package immediately tells a message that you consider the receiver important. Which I do! Normally I just wrap the gift in paper, tie a ribbon around the package, and either tie a bow or curl the ribbon ends with scissors. 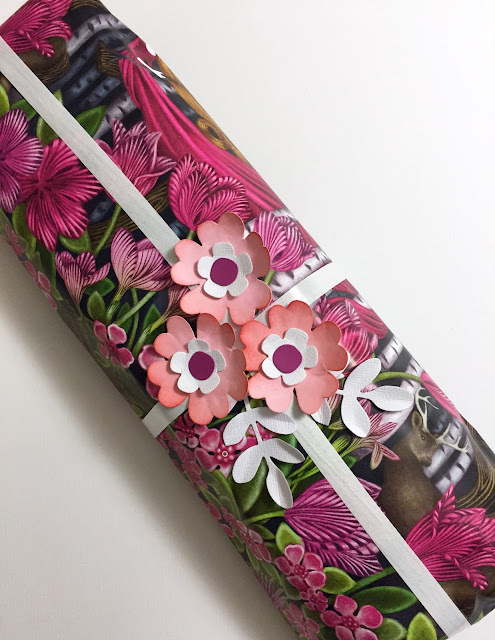 Curled ribbon can look very pretty on a package, but if all gifts always look identical, you may want to try something different. I got the idea for a flower decorated gift from the beautiful gift wrap paper I found in Ikea. This colourful paper is from their 'Växtglädje' collection. 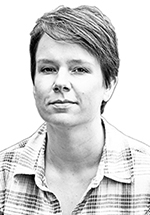 I was pleasantly surprised about the quality of the paper, as it was heavier than other standard papers I had used. 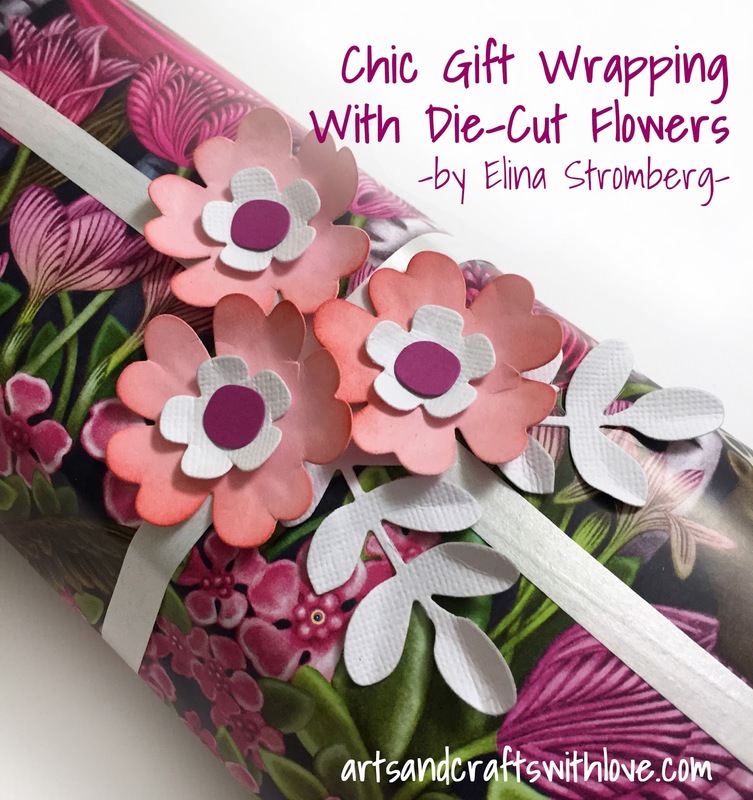 Easy to work with and to wrap around my gift! For ribbon I used simple white curling ribbon. I cut two pieces, wrapped them around the package and secured the ends with tape. I did not tie a knot as I wanted the base for my flowers to be flat. 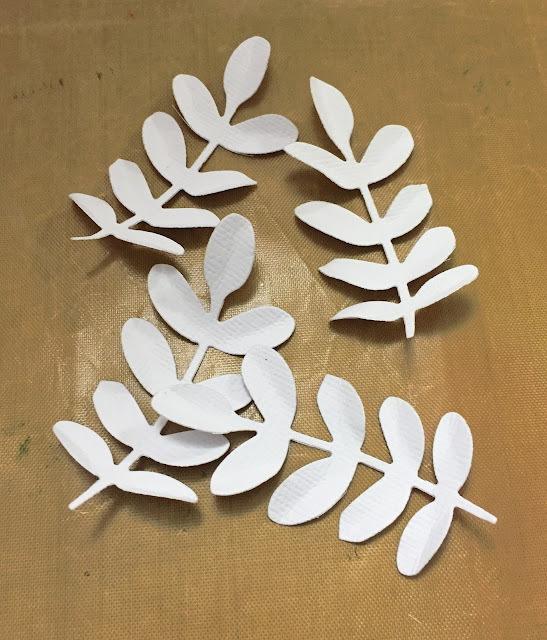 Then I die-cut leaves from white cardstock, using this Sizzix/Craft Asylum leaf die. I folded the leaves gently for creating a 3D look. The flowers are die-cut from pink, white and purple cardstock. For this I used this lovely Sizzix/Craft Asylum die set fom their woodland collection. 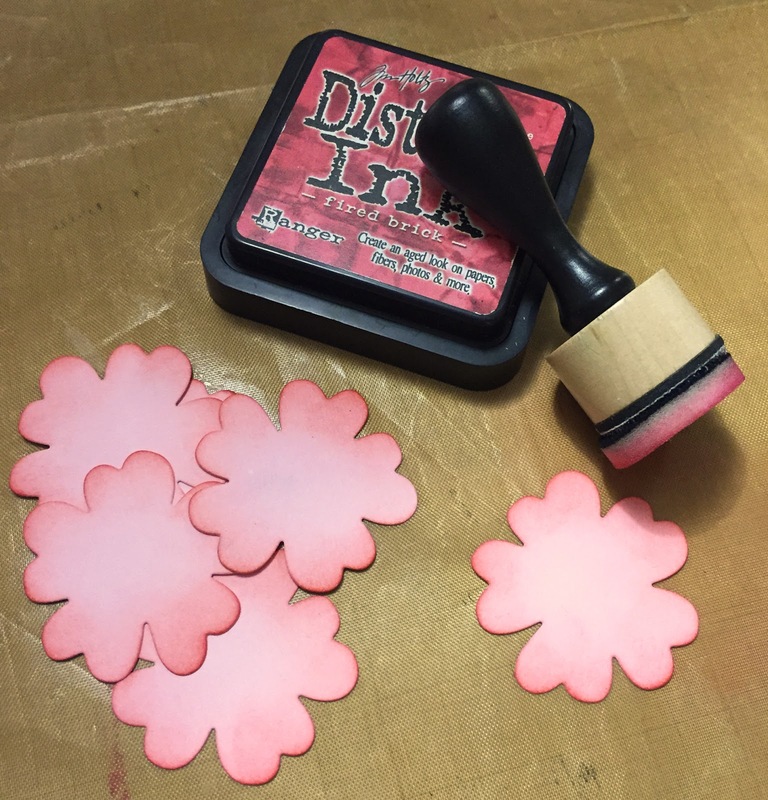 I inked the edges of the pink flowers, and curled the flower petals by pressing them with a rounded pen cap against a mouse pad. 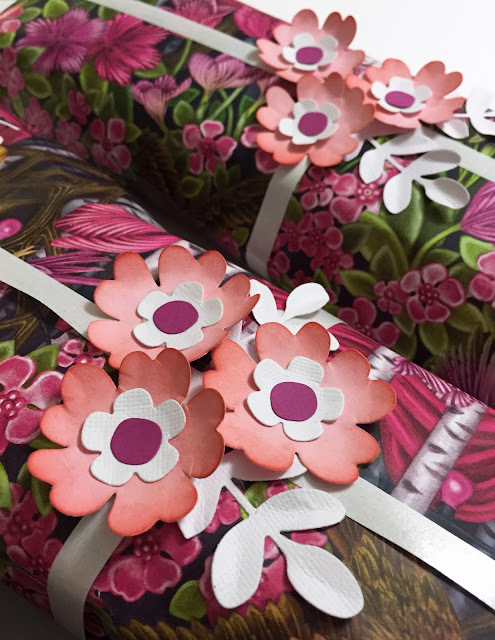 The final step was to glue the flowers together and to glue the assembled flowers and the leaves on the gift. 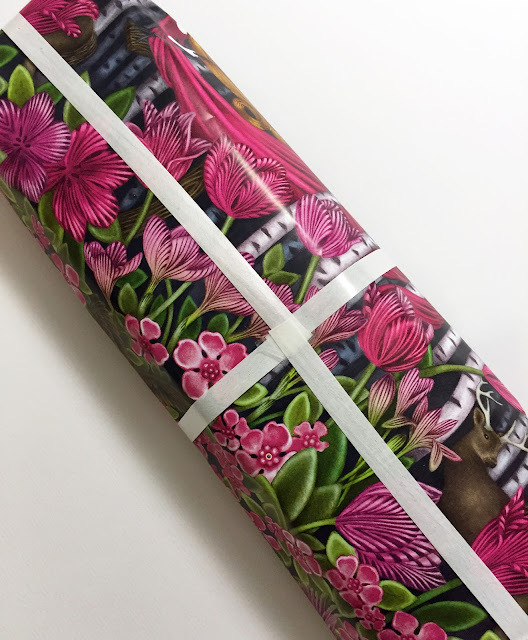 For this I could have used any type of paper glue, but knowing that my packages had to be carried in a bag for a little while I decided to use Tacky Glue for ensuring that the flowers would not fall off. How easy and quick that was to make! And the receivers loved their flower decorated gifts! Wishing you a blooming day. Thanks for stopping by! This summer has been exceptionally chilly in Finland. I guess they said on the local news that the current temperatures are similar to normal September temperatures. SEPTEMBER! Come on, it's only July, Finland is closed and on vacation, and we're supposed to be enjoying from sunny and warm summer days! Well, as a paper crafter I haven't suffered from the rainy weathers too much. When the weather has been too wet or cold to go out, I've sat down by my crafting table, pulled out my patterned papers, paints, inks and embellishments and started crafting. 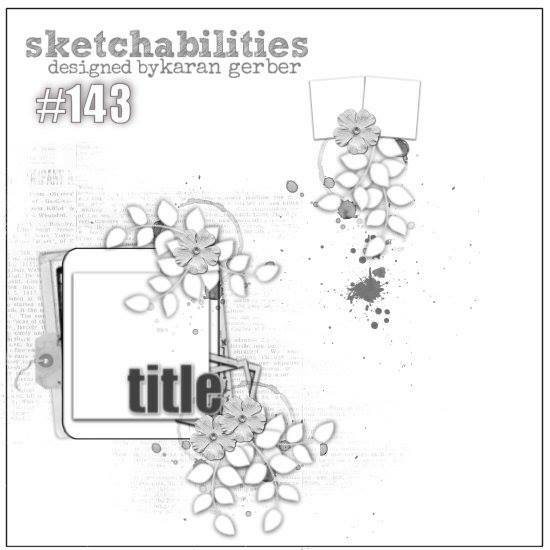 I've made scrapbooking layouts, a few cards, coloured with my markers, and sketched and painted on my art journal. I have to say that It's been a while since I've drawn and sketched this much, lol! 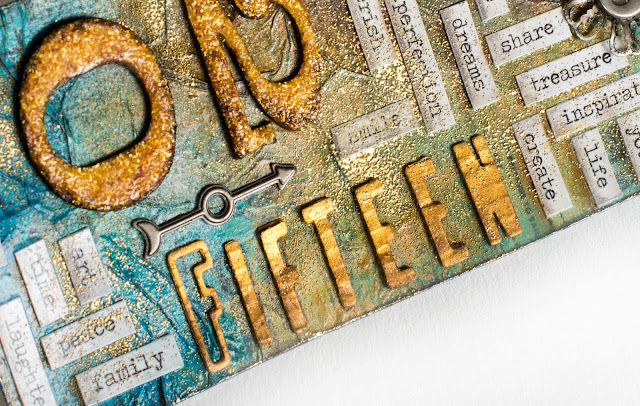 The dark background was first covered with clear gesso which allowed me to use wet media on my project i.e. 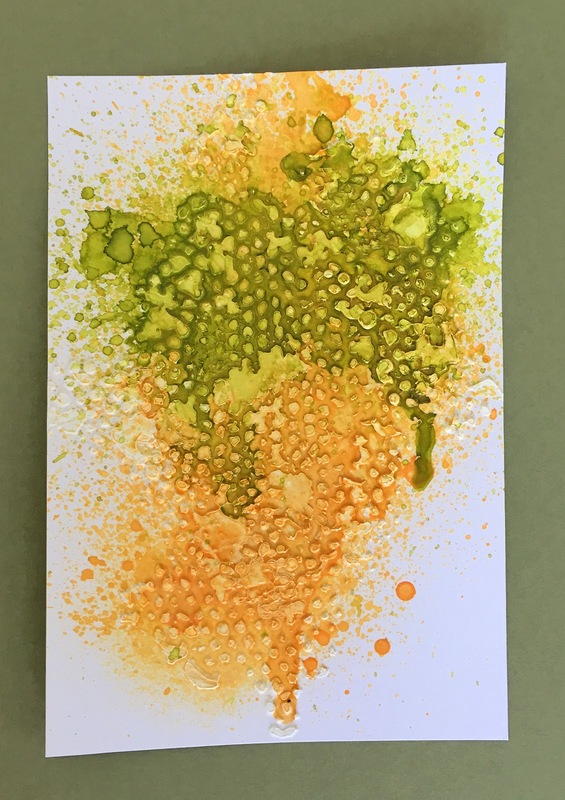 white acrylic paint as watercolour. 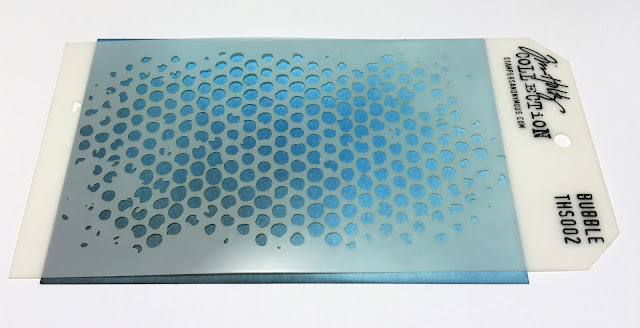 Once the paint was dry I added some stamped patterns and turquoise lines with acrylic paint (using the edge if an old credit card as an applicator). 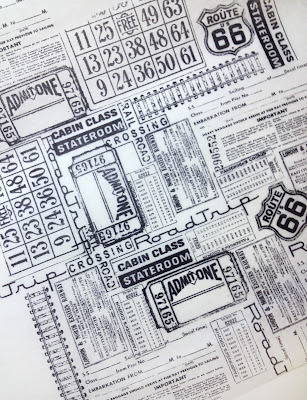 Background paper is from American Crafts / DIY Shop collection. ... and golden title text is from American Crafts Thickers set. The contrast between dark background and white paint was pretty strong, so I thought the layout did not need too many embellishments nor additional elements. And I have to say that I'm pretty happy with how my page turned out! I hope my layout got your creative juices flowing! More inspiration is available in Sketchabilities blog; just follow this link to see all the amazing layouts by the Design Team. 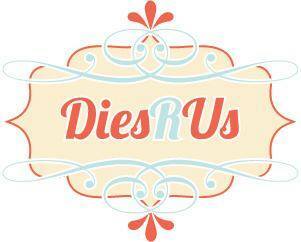 Hope you decide to play along; you have until July 28 to enter! Wishing you a nice day ♥. 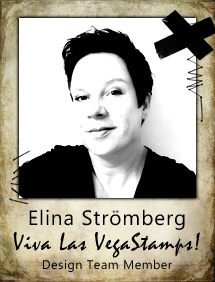 Bit over two years ago I got happy mail from Melina telling me that I had been accepted to a new challenge design team, 123 Get Scrappy. 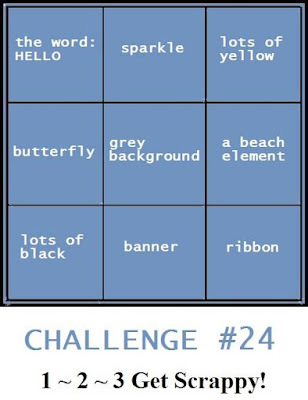 Playing with the monthly challenge grids has been so much fun, but most of all it has been amazing to get to know Melina and the other lovely girls in the team. Hosting a challenge blog is a lot of work and I can fully support Melina in her decision to close the challenge blog and to allocate more time on her own projects and personal life matters. We'll anyway stay in touch, don't we! 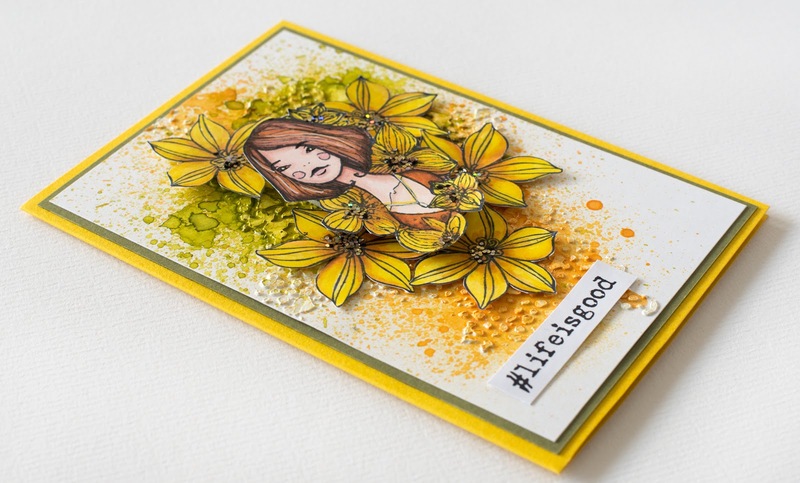 Last 123 Get Scrappy challenge has been revealed, and the design team has made beautiful layouts for your inspiration. Just follow this link to see them all! 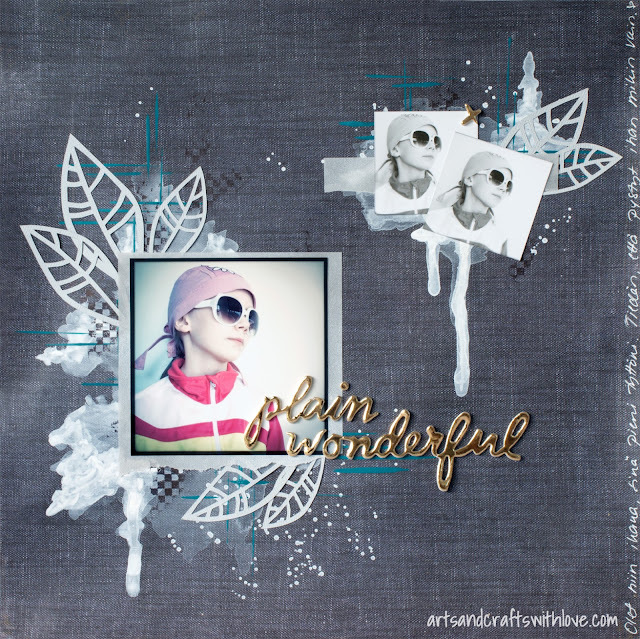 Grey background paper is from SODAlicious collection. 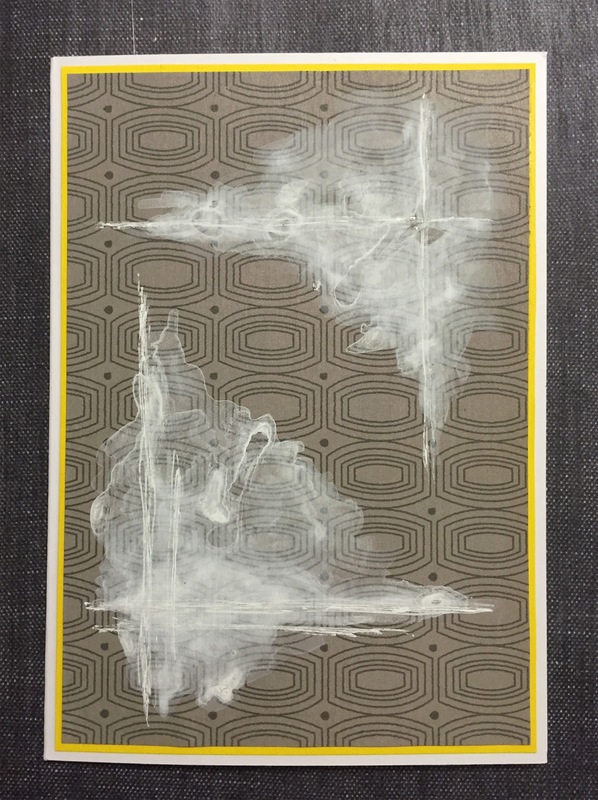 I covered the middle area with a a layer of white gesso and added some yellow and brown mists. 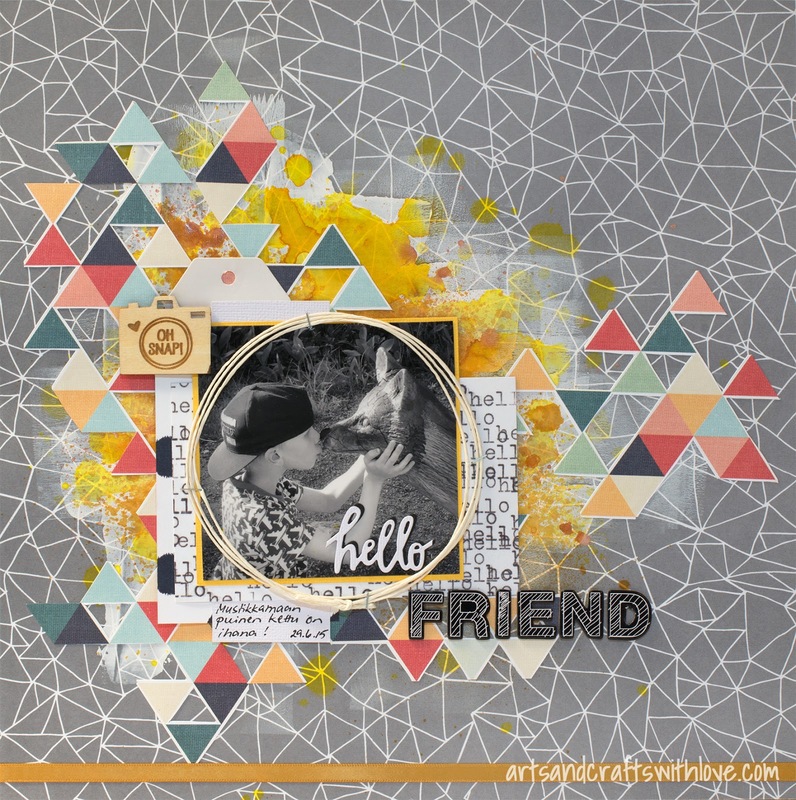 Even if the background pattern was a bit busy to start with I used a sheet of another triangle patterned paper for bringing more colour onto my project. Using a craft knife I cut out half of the triangles, and glued the triangle grid on the misted background. I think it worked out pretty well! The photo of my son and the wooden fox is from last week when we visited the Helsinki zoo together. Close to the zoo entrance there's a fox couple made of wood, and my kids just love those statues. We never pass them without making a short stop to say hello! lol! 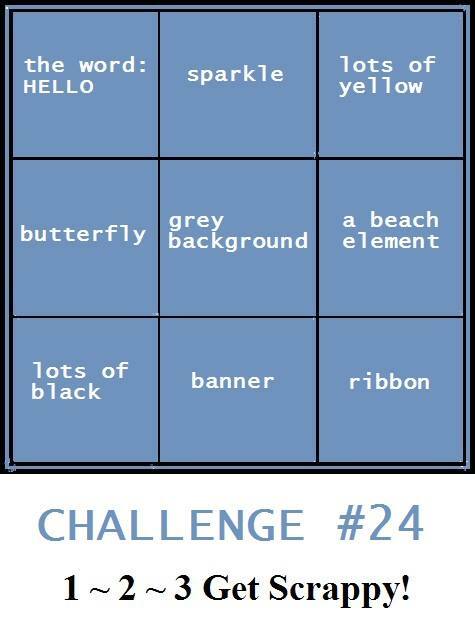 Wishing you a nice weekend, and hoping to see many entries for our final challenge #24! 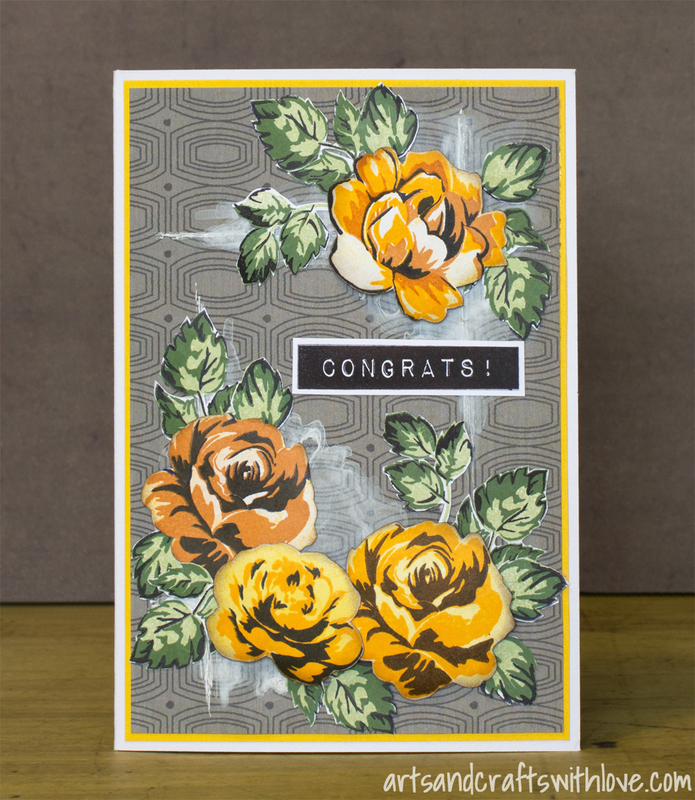 Another card for July Take It Make It challenge: Fifties roses! 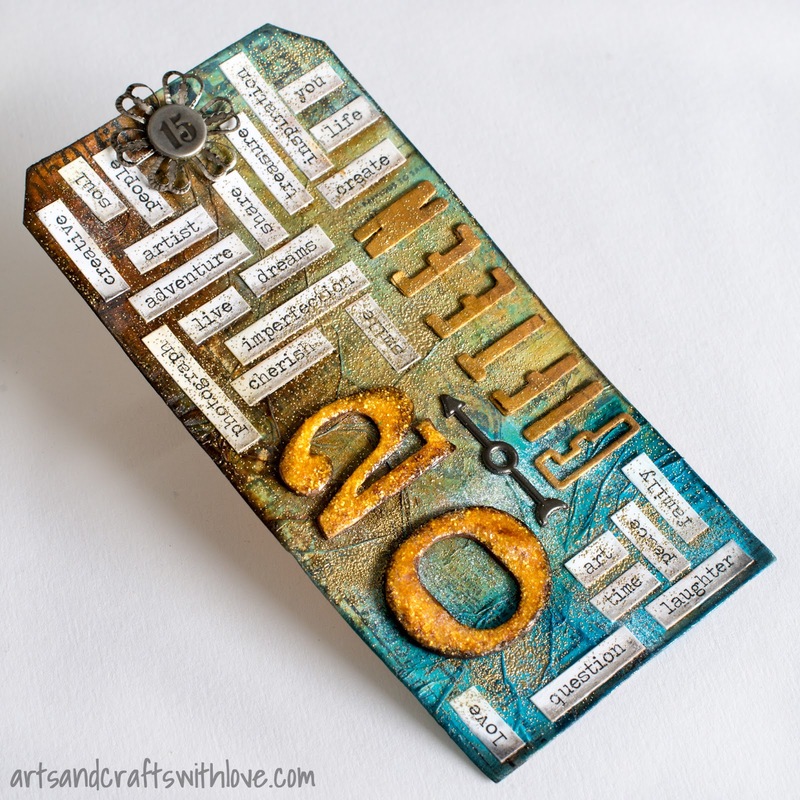 Craft Stamper 'Take It Make It' July challenge started a week ago, and I'm amazed by the number of gorgeous projects the talented crafters have already made and shared with us: Over 40! 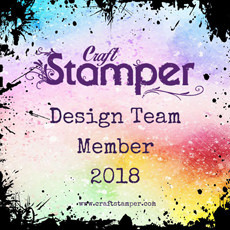 If your stamping and paper crafting inspiration needs a bit of wakening, I suggest you hop over to Craft Stamper blog to see a wonderful new collection of inspirational projects from the Design Team. 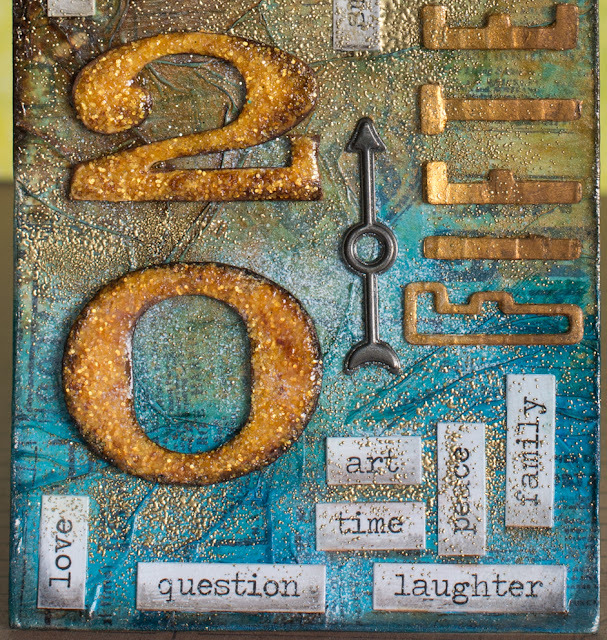 My inspiration source was a new stamp set by Altenew I received in mail just on time for this project. 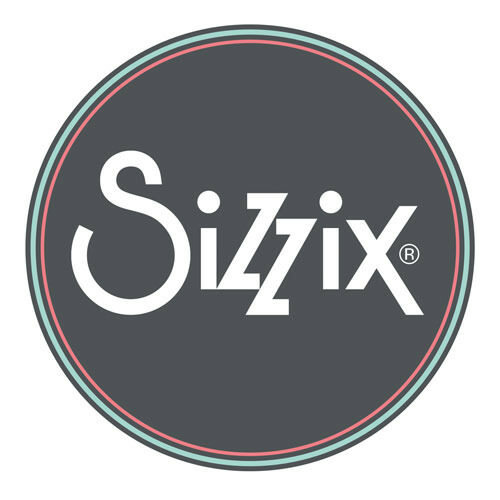 I love their products! 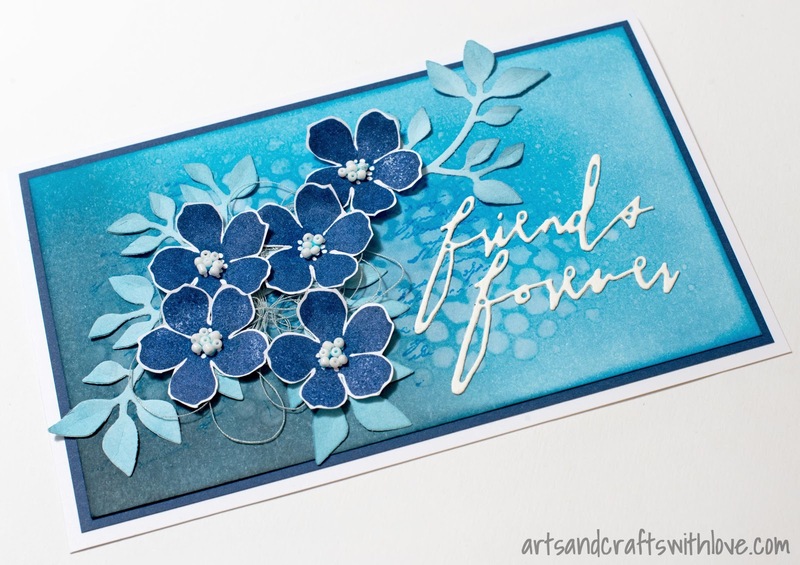 I had seen wonderful flower cards made with their set, so I had to try them out myself, too! I loved the idea of layering stamped images and creating multi-coloured flowers, and with clear polymer stamps aligning the images shouldn't be too hard. True! The background patterned paper was quite thin, so I started with brushing a thin layer of clear gesso on the paper. 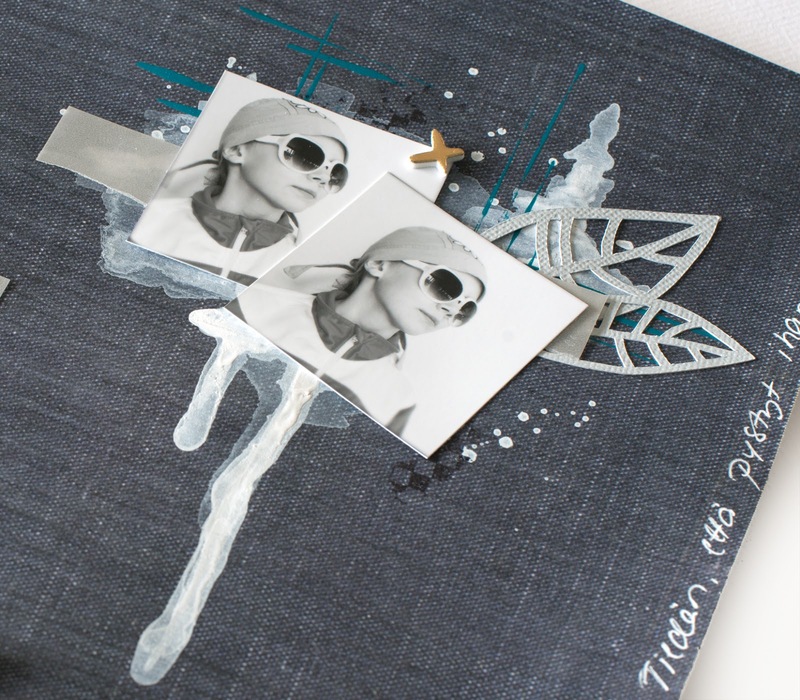 Clear gesso is a wonderful media, as it dries transparent leaving the patterns of the paper to show beautifully, but prepares the paper for different kinds of wet media. I wanted to watercolour my background, but as I did not have white watercolours, I simply diluted white paint with water. A thin layer of gesso also prevented the paper from buckling. Altenew blog is filled with stamping inspiration, just follow this link and get inspired! 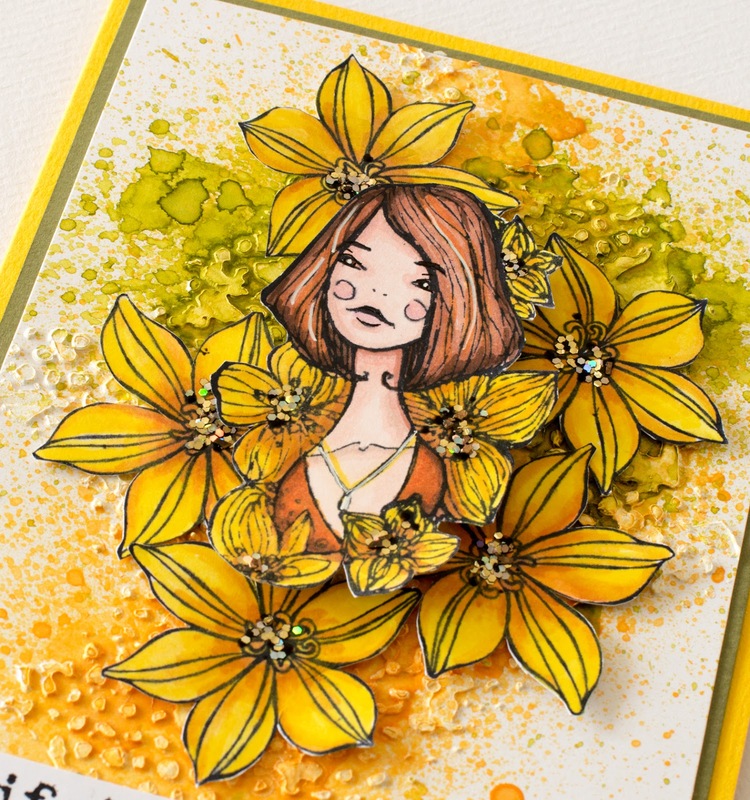 And remember to play along with our Craft Stamper challenge; there are amazing prizes to be won! 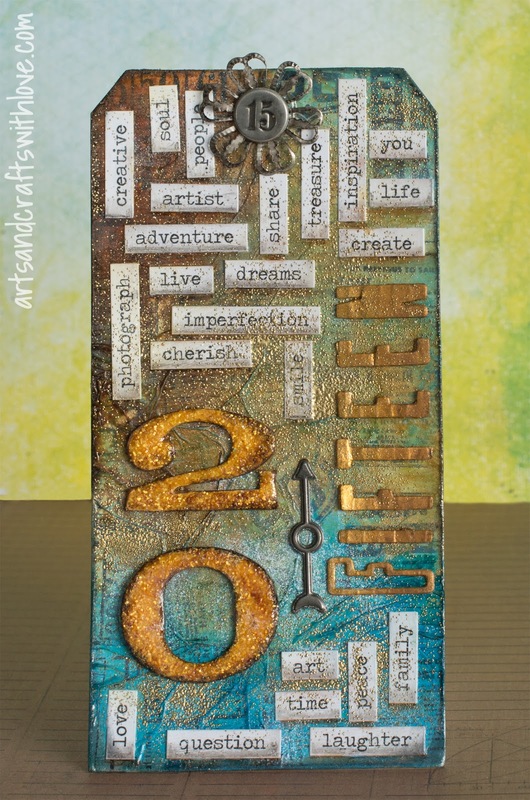 You have time until July 29th, so grab your papers and stamps and get creative! 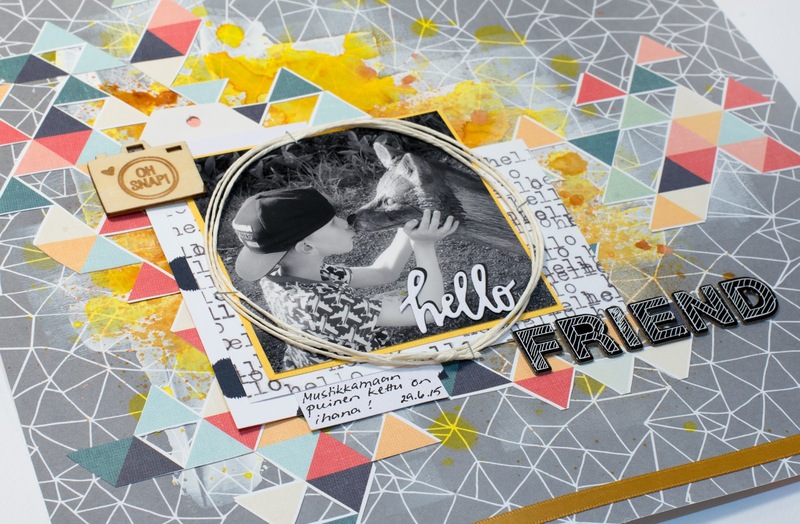 It's first Friday of the month which means that it's time for a new Craft Stamper Take It Make It challenge! In July the theme is 'Take A Stamp', so anything goes, as long as you have used stamping somewhere on your project. Easy, isn't it! 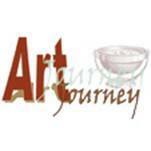 Our lovely sponsor this month is Art Journey, and one lucky winner will get an amazing prize: Four stamp plates from Art Journey! 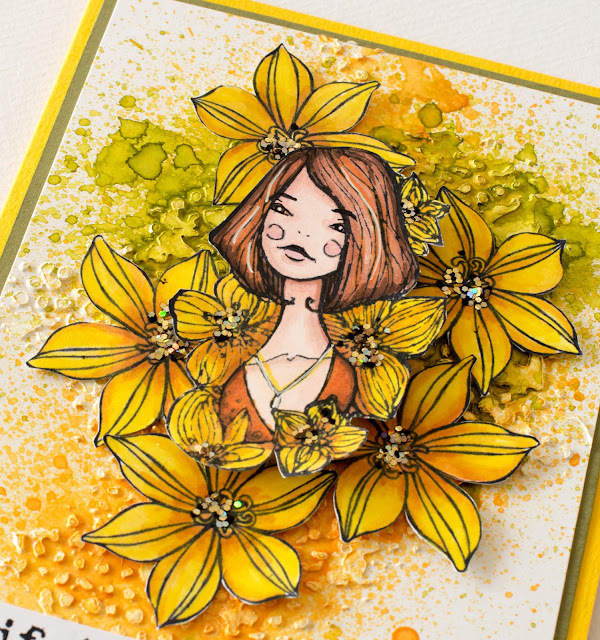 My July inspiration card is filled with bright summer colours. For the card center I used two different stamps; a girl stamp by 3rd Eye, and a flower stamp by Stampin'Up. 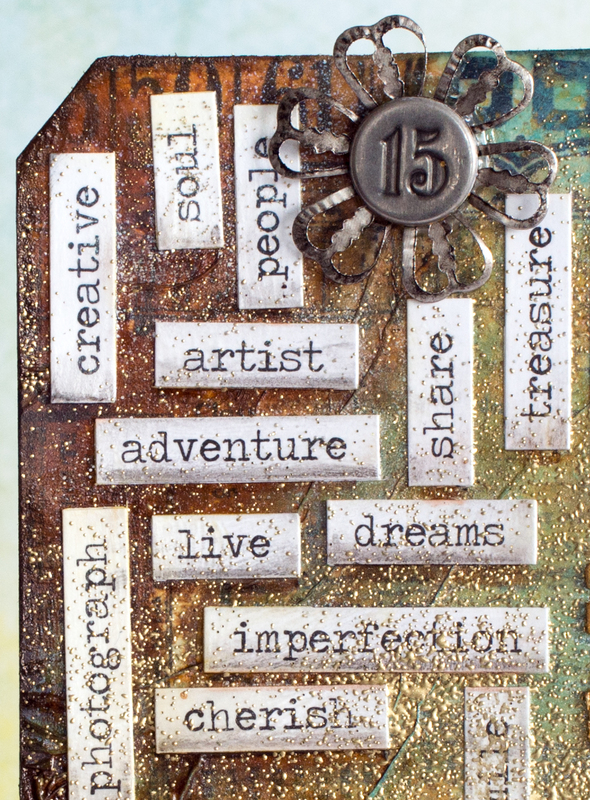 The sentiment text stamp is from a Stampers Anonymous / Tim Holtz collection. 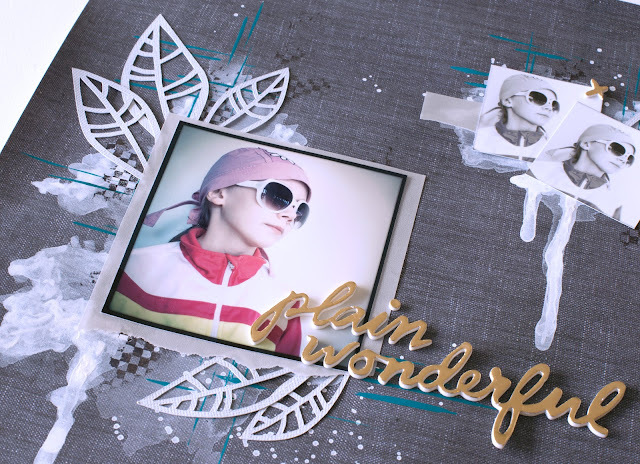 For the white background I used simple white heavy office paper, and started with masking patterns on the paper with texture paste. Once dry I misted some green and yellow colours on the texture paste. Some days back I had purchased two 6 pen sets of new Chameleon pens. The pens were quite expensive so I did not right away buy a large set with all possible colours. I thought that these 12 would be enough for figuring out if they were better than my current ProMarkers and if I liked them or not. After a bit of colouring I'm convinced that I do like them a lot, but I'm still not sure if I need more colours. 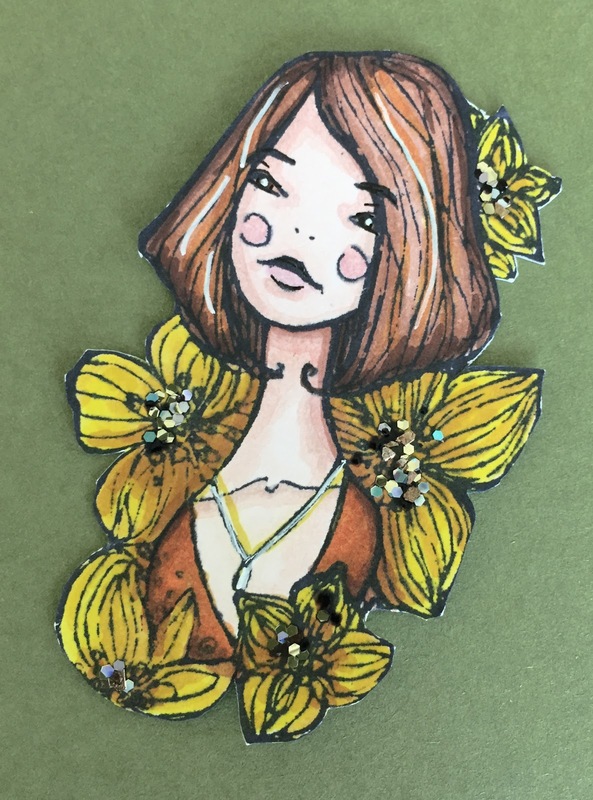 I like the idea that one pen would give me many different tones to the same colour, so that I did not have to purchase several pens for creating great shadings on my colouring projects. Working with the pens looked so amazingly simple on the introduction video! When carrying your pens to a crop or vacation trip it's a great idea that you don't have to pack and carry too many pens with you. But if you are an impatient crafter you might find it too time consuming to have to 'recharge' the light tone over and over again. The light tone will change to a darker one in a matter of seconds, so you will need to stop the colouring and change the colour tone many times. 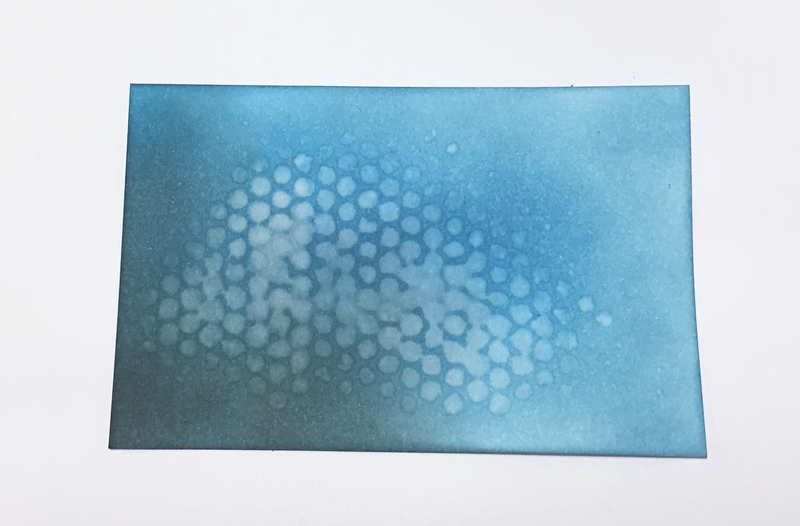 After 'recharging' the light tone you may want to test the colour on a piece of scrap paper, as it's not easy to predict how light the new tone has become. 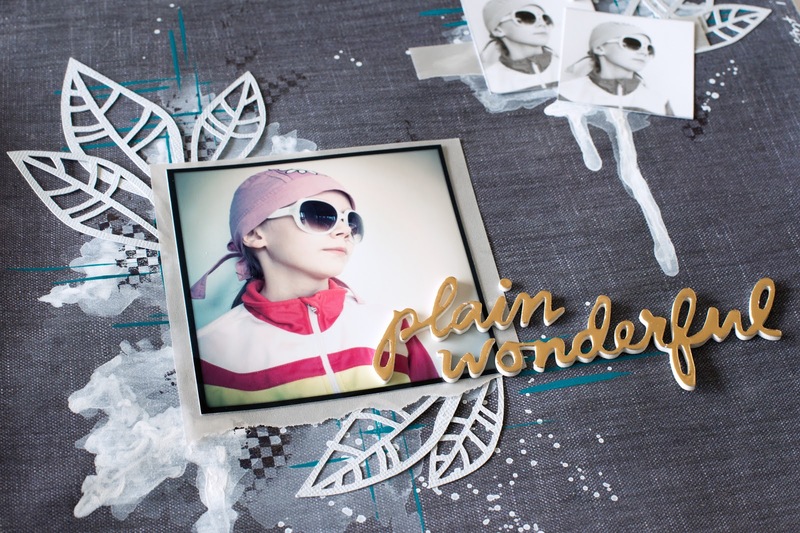 You probably don't want to do this colour testing on your unfinished colouring project! 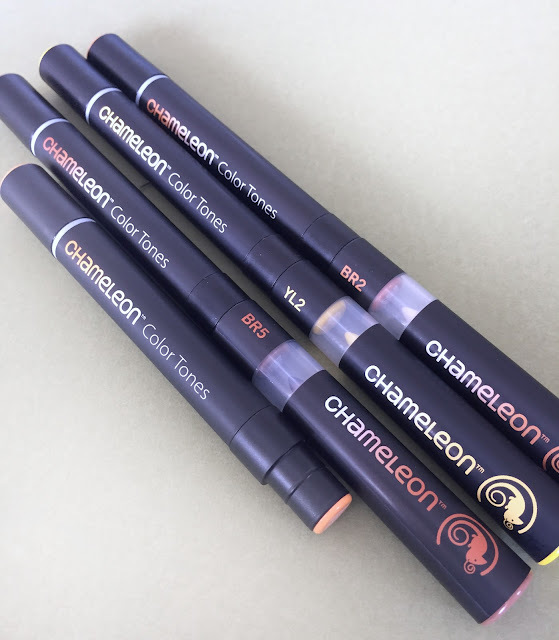 But if you don't mind the bit slower working process I have to admit that the Chameleon pens are of good quality; the colours mix together nicely and the colours look really nice on various surfaces. The nibs are changeable and colours refillable which make these pens last long. During next weekend I will for sure be doing more colouring and Chameleon testing; stay tuned for more updates! Assembling the card did not take long. First I glued down the fussy cut flowers, and attached the girl image in the center with thick 3D stickers. 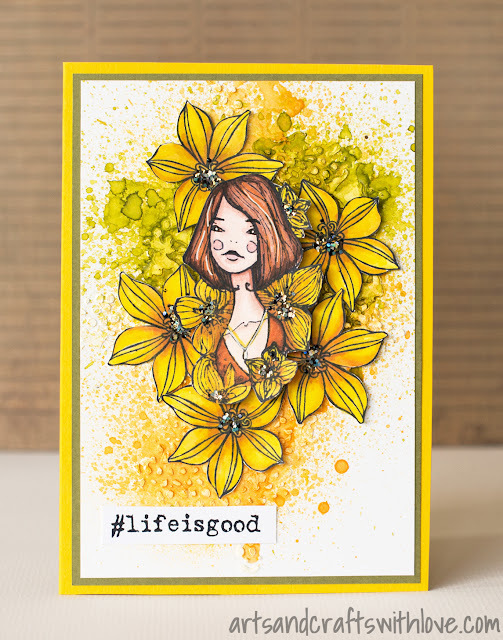 Even if the girl and the flowers are not from same stamp manufacturer I think they go pretty well together! For decorating the flowers I used Stampendous 'Spoonful of Midnight' embossing powder that has glitter elements mixed with embossing enamels. What a great medium! 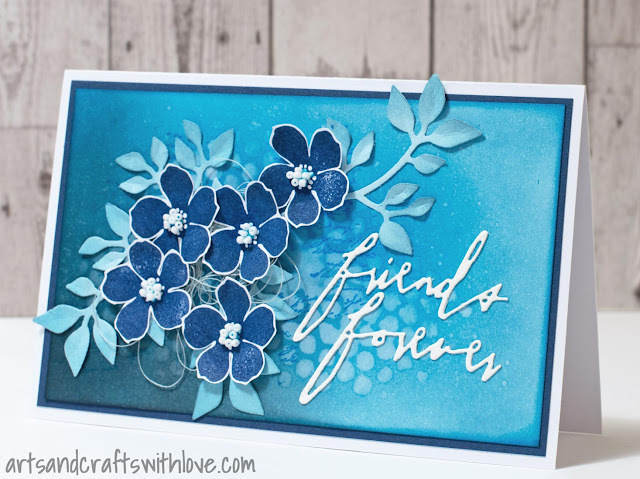 I suggest you hop over to Craft Stamper blog to see all the gorgeous cards the design team has made. Hope they will inspire you to play along! I started with inking the background with a few shades of blue and black Distress Inks. As paper I used slightly glossy heavy office paper. 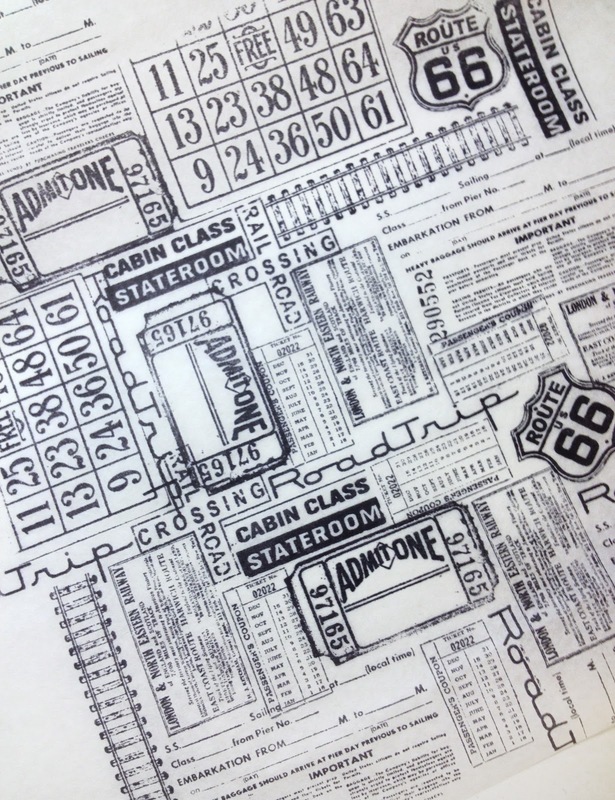 When the entire area was inked I placed a stencil on the inked paper and misted it gently with water. Then I removed the stencil, let the water drops mix with the ink for a few seconds before pressing the paper with a paper towel. Before gluing down the leaves I inked the edges with light blue colour. 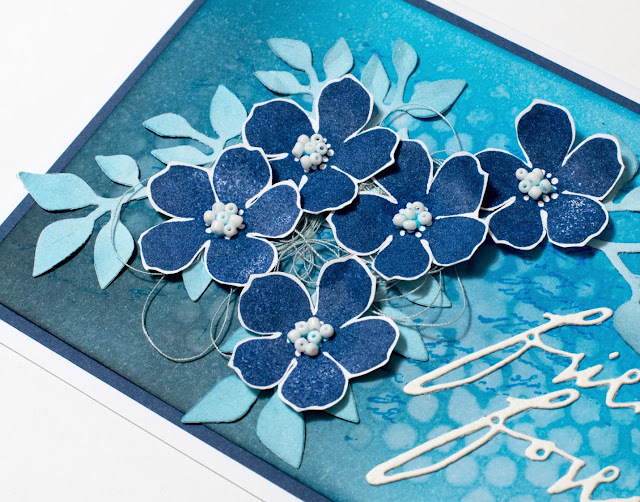 Grey sewing yarn under the flowers adds a bit more texture and interest to the card. As finishing touch I glued white seed beads on the flowers. Done! 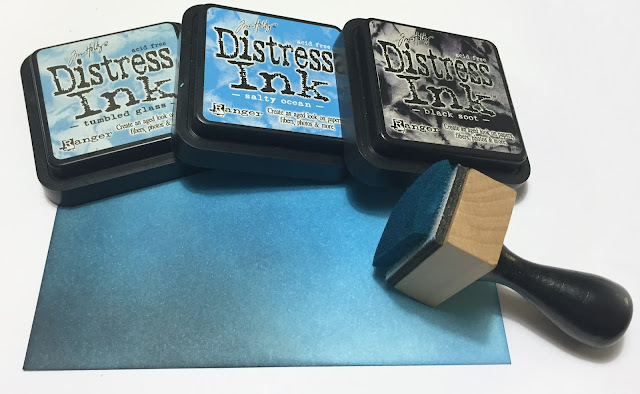 I hope you take out your blue paints, papers or inks and play along. Follow this link to see more inspiration by the MMCC design team. 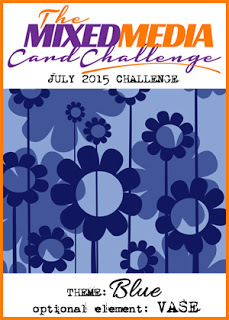 Challenge rules and linky tool can be found there, too.